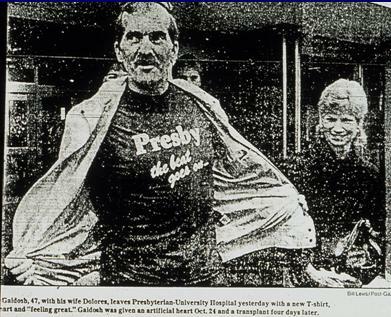 It was 30 years ago on October 24 in Pittsburgh that a Jarvik-7 total artificial heart was implanted into a patient at Presbyterian University Hospital. This was the first clinical use of a mechanical blood pump in Pittsburgh, and 47-year-old Thomas Gaidosh (pictured) was the first recipient of this artificial heart. The surgery was an emergency measure to keep Mr. Gaidosh alive until a donor heart was available for him. The event was front page news in the Pittsburgh Press. Mr. Gaidosh received a heart transplant within 4 days of the Jarvik-7 implant. He went on to live 12 more years. He was a wonderful supporter of the mechanical circulatory support program launched by Bartley Griffith, MD, and now under the direction of McGowan Institute for Regenerative Medicine faculty member Robert Kormos, MD, director of UPMC’s Artificial Heart Program and co-director of the Heart Transplantation Program. After 30 years, this exceptional program has helped almost 1,000 mechanical circulatory support patients (adult + pediatric). UPMC’s artificial heart program is one of the first to be established in the United States and is considered one of the most experienced centers. Over the years, the center has worked with a number of device manufacturers, performing laboratory and clinical studies as well as serving as a national training center for other medical centers implementing programs. As such, the team has seen the technology evolve to better meet the needs of patients with heart failure. The team is a unique combination of clinical specialists and bioengineers who work together to optimize the patient’s therapy. The lab is located on Technology Drive with shuttle stops routinely. 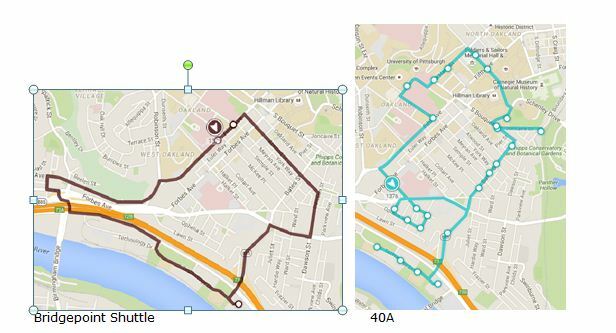 Check out PITTSHUTTLE for times. Contact Lori at the McGowan Core Histology Lab and ask about our staining specials. Email perezl@upmc.edu or call 412-624-5265. For your convenience, a histology form including services and cost, is available here. As always, you will receive the highest quality histology in the quickest turn-around time. Are you considering incorporating FLOW CYTOMETRY into you research program? 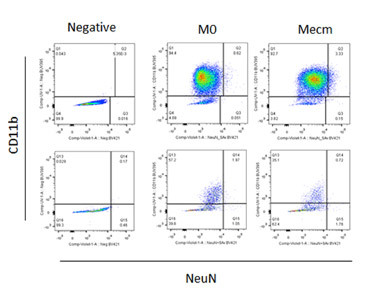 Or do you currently use flow cytometry and want or need to move beyond 2, 3, or 4color flow cytometry? With so many different antibodies, dyes, fluorophores and techniques available, sometimes it’s difficult to decide what will best for your experiment. Some antibodies work best using a bright color while others work best using a dim color. Some colors simply don’t play well with each other. Truth be told, the multitude of possibilities can be really confusing. It’s sometimes simpler to just keep doing what we’ve always done. But with a little understanding we can improve and expand our experiments. Join us on Wednesday, Dec. 9th when BD’s Technical Applications Specialist Andrew Bantly will discuss Multicolor Panel Design and learn how to utilize the new colors available for the Blue, Red, Violet and UV lasers. Please RSVP to Lynda so we have enough room and food for all interested parties. The 9th Symposium on Biologic Scaffolds for Regenerative Medicine will be held at the Silverado Resort in Napa, California on April 28th – 30th, 2016. An in depth account of the most recent findings regarding the mechanisms by which biologic scaffolds facilitate constructive remodeling of tissues; including body wall (skeletal muscle), cardiovascular, reconstructive surgical applications such as breast and pelvic floor, and whole organs such as liver, lung and heart. Identification and discussion of manufacturing issues such as tissue source, decellularization methods, and sterilization decisions that affect the quality and performance of biologic scaffolds for surgical applications. A review of clinical experiences, especially general surgery, orthopedic and trauma related challenges, neurologic applications, gastrointestinal applications, and cardiovascular applications. Identification and discussion of the effect of the host innate immune response upon scaffold remodeling and clinical outcome. List of invited (and accepted) speakers to date: Robert M. Nerem, PhD (Georgia Institute of Technology), Arnold I. Caplan, PhD (Case Western Reserve University), Jeffrey M. Davidson, Ph.D. (Vanderbilt University), Cyrus Ghajar, PhD (Fred Hutchinson Cancer Research Center), Jeffrey A. Hubbell, PhD (Swiss Federal Institute of Technology, EPFL), Kristen Jones, MD (University of Minnesota), C. James Kirkpatrick MD PhD DSc FRCPath (Johannes Gutenberg University), Robert G. Martindale, MD, PhD (Oregon Health & Science University), Charles D. Mills, PhD (BioMedical Consultants), Laura E Niklason PhD, MD (Yale University), Frederick J. Schoen, MD, PhD (Harvard University), Allan S. Stewart, MD (Mount Sinai Hospital NYC), and Nadia Rosenthal, PhD (Monash University, Australia). McGowan Institute for Regenerative Medicine faculty member J. Peter Rubin, MD, Professor and Chair of the Department of Plastic Surgery at the University of Pittsburgh Medical Center, is a sponsor investigator for a U.S. Department of Defense (DoD) Congressionally Directed Medical Research Program project, and hopes to recruit up to 20 patients in a randomized, within-patient controlled, feasibility study. 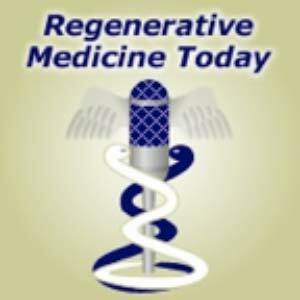 CDR Mark Fleming at Walter Reed National Military Medical Center is the project principal investigator. The investigator-initiated trial is aimed at evaluating whether Avita Medical Ltd.’s ReCell® treatment combined with widened split-thickness skin grafts is more effective in treating full-thickness traumatic wounds than conventional skin grafts. Outcomes for the area treated with Regenerative Epithelial Suspension (RES™) produced using the ReCell® device will be compared to outcomes of another area on the same patient treated with only conventional meshed autografting. The first patient has been treated in the study, which is funded through a DoD research program and taking place at Walter Reed in Bethesda, Maryland. Avita Medical will play an advisory supporting role in the trial. “When treating injuries associated with severe trauma, physicians are often limited in choice of donor sites for skin grafts, and so there is a real need for an acceptable alternative to conventional full and partial thickness skin autografting,” said Andrew Quick, Avita Medical VP Research & Technology. The July/August 2015 issue of Army Technology Magazine reported that the ReCell® device was regarded as having great potential for treating burn injuries among U.S. military personnel. Previous use of ReCell® at Walter Reed, under compassionate use dispensations granted by the FDA, has included treatment of soldiers wounded in Afghanistan and Iraq. The Company believes the device, being fully portable, battery-powered, and needing only ambient storage temperatures, is well suited for deployment in field hospitals. ReCell® is Avita Medical’s unique proprietary technology that enables a clinician to rapidly create, at point of care in approximately 30 minutes, Regenerative Epithelial Suspension (RES™) using a small sample of the patient’s skin. RES™ is an autologous suspension comprising the cells and wound healing factors necessary to regenerate natural, healthy skin. RES™ has a broad range of applications and can be used to restart healing in unresponsive wounds, to repair burns using less donor skin yet with improved functional and aesthetic outcomes, and to restore pigmentation and improve cosmesis of damaged skin. As reported by John Tozzi of Bloomberg Business, when McGowan Institute for Regenerative Medicine affiliated faculty member and Carnegie Mellon University (CMU) biomedical engineer Adam Feinberg, PhD, tried to figure out how to synthesize human tissue 4 years ago, his supplies were prosaic: a kitchen blender, some gelatin packets from the supermarket baking aisle, and a $2,000 3D printer. “I had no external funding when I started, so we did it kind of on the cheap,” said Dr. Feinberg, Associate Professor in the Departments of Biomedical Engineering and Materials Science and Engineering at CMU. In a paper published recently in Science Advances, Dr. Feinberg and his colleagues describe how they eventually refined the technique to print structural replicas of the tissue of arteries, brains, and other organs out of proteins like collagen and fibrin. While the forms they created aren’t functioning organs with living cells, they could one day act as a scaffold on which to grow actual tissues. Dr. Feinberg’s fundamental advance is figuring out how to keep the soft structures created by a modified MakerBot 3D printer from collapsing under their own weight. Unlike plastic, the normal material of a 3D printer, collagen won’t hold its shape as it is being synthesized unless it has some support. The research team started thinking about how Jell-O molds can suspend pieces of fruit in a sugary gel. They experimented with gelatin, blending it into a slurry of fine particles. The slurry would support the structure being built, layer by layer, while still allowing the printer’s nozzle—modified with a syringe—to move freely. When the printed object is complete, it would hold together on its own, and the supporting gel could be melted away in water at body temperature. In the near term, the new method of 3D printing might let doctors test medical treatments on laboratory replicas of patients’ own body parts. Drug companies could use such models to test risky new drugs before they’re used in humans. A team led by scientists from the Florida campus of The Scripps Research Institute (TSRI) and the University of Pittsburgh has shown for the first time how one set of specialized cells survives under stress by manipulating the behavior of key immune system cells. The new study, published recently in the journal Nature Communications which included co-authors McGowan Institute for Regenerative Medicine affiliated faculty members Donna Stolz, PhD, associate director of the Center for Biologic Imaging, University of Pittsburgh School of Medicine, and an associate professor in the Departments of Cell Biology and Pathology at the University of Pittsburgh, and Simon Watkins, PhD, founder and director of the Center for Biologic Imaging, a member of the Pittsburgh Cancer Institute, and professor and vice chairman within the Department of Cell Biology, involved mesenchymal stem cells—which live in bone marrow and can differentiate into several different cell types used in bone and connective tissue—and macrophages—immune cells that usually respond to infectious agents or damaged cells by engulfing and devouring them. The team’s experiments showed that, like all other cells, mesenchymal stem cells experience stress due to tissue injury and inflammation. When this stress results in damage to the mitochondria (the power houses of the cell), the mesenchymal stem cells recruit the immune system’s macrophages—but in an unusual way. By reengineering macrophage action with secreted microRNA, the stem cells protect themselves from being targeted and instead package their damaged mitochondria into small sacs known as vesicles and send them out to be engulfed by the macrophage. Once macrophages subsume the damaged mitochondria, the macrophages are able to repurpose the mitochondria for their own use, replenishing their own energy supplies. Blocking the exchange of damaged mitochondrial to macrophages causes death of the stem cells. Therefore, the process is mutually beneficial. In addition to Drs. Phinney, Ortiz, Stolz, and Watkins, the other first author of the study is Michelangelo Di Giuseppe of the University of Pittsburgh. Other authors include Joel Njah, Sruti Shiva, Claudette M. St. Croix, Y. Peter Di, George D. Leikauf, and Jay Kolls of the University of Pittsburgh; Ernest Sala of Hospital Son Espases, Spain; David W.H. Riches of National Jewish Health, Denver, CO; Giuseppe Deiuliis and Naftali Kaminski of Yale University; Siddaraju V. Boregowda of TSRI; and David H. McKenna of the University of Minnesota. Illustration: The Scripps Research Institute and the University of Pittsburgh. With the potential to allow quadriplegics to operate robotic limbs, to reverse damage caused by Parkinson’s disease, and to map the pathways of the 100 billion neurons of the brain, microelectrode arrays—or electronic brain implants—are keys to the human-computer interface. Two National Institutes of Health (NIH) grants totaling $4.7 million to researchers at the University of Pittsburgh’s Swanson School of Engineering will help to further research in improving how the implants perform in the brain and survive the body’s immune responses. The principal investigators for this work are McGowan Institute for Regenerative Medicine affiliated faculty members Xinyan “Tracy” Cui, PhD, William Kepler Whiteford Professor of Bioengineering and director of the Neural Tissue/Electrode Interface and Neural Tissue Engineering (NTE) Lab, and Takashi “TK” Kozai, PhD, assistant professor of bioengineering and founder of the Bio-Integrating Optoelectric Neural Interface & Cybernetics Lab (BIONIC Lab) at Pitt. Implants come in many shapes and sizes and contain anywhere from one to hundreds of electrodes in a single array. Large arrays allow for better connectivity with the brain, but they also have a greater risk of triggering the body’s defense mechanisms. This causes inflammation of the neural tissue, which can significantly reduce the quality of the implant’s signals over time. Even though it won’t cause harm to the patient, the body’s rejection of foreign substances is one of the major obstacles limiting the usage of microelectrode arrays. 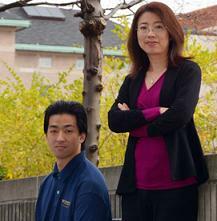 Researchers at Pitt’s NTE Laboratory have been developing ways to integrate the implants with the host neural tissue. Recently, two more grants from NIH will expand the NTE Lab’s research into other areas of microelectrode array technology. Dr. Cui will serve as principal investigator of “Inhibition of Neural Electrode-Mediated Inflammation and Neuronal Cell Death.” The study will receive $3.1 million over 5 years and will uncover the role of the caspase-1, an enzyme activated at the earliest detectable moment after ischemia, trauma, and other neurodegenerative conditions. Blood-brain barrier (BBB) injury has been found around implanted electrodes, but the extent and the cause-and-effect mechanism underlying BBB damage and neural recording failure has not been established. After mapping the brain vasculature with two-photon microscopy, Dr. Kozai will implant one group of electrodes that pass through large arterioles and another group that avoids major blood vessels. By comparing the performance of electrodes in the two situations and tracking dynamic changes with two-photon microscopy, Dr. Kozai will be able to determine the impact of BBB damage on signal degradation recorded from the implants. The co-investigators on these two grants are Dr. Alberto Vazquez (Radiology), Dr. Robert Friedlander and Dr. Diane Carlisle (Neurosurgery), and McGowan Institute for Regenerative Medicine affiliated faculty member Dr. Simon Watkins (Center for Biological Imaging). Chronic exposure to arsenic can lead to stem cell dysfunction that impairs muscle healing and regeneration, according to a pre-clinical study conducted by researchers at the University of Pittsburgh’s School of Medicine and Graduate School of Public Health. In a report published in Stem Cells, McGowan Institute for Regenerative Medicine affiliated faculty members Fabrisia Ambrosio, PhD, and Donna Stolz, PhD, and colleagues noted that inhibiting a certain protein in an inflammatory pathway can reverse the harmful effects and that environmental exposures might explain why some people don’t recover easily after injury or surgery. 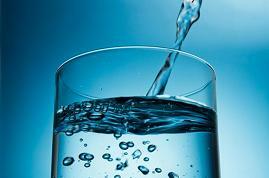 More than 140 million people worldwide and 4 million Americans chronically ingest arsenic in their drinking water, said senior investigator Dr. Ambrosio, assistant professor of physical medicine and rehabilitation at Pitt. The 21st most abundant metal in the Earth’s crust, arsenic is naturally present in soil and bedrock-walled wells and has no odor, color, or taste. In the study, mice drank water for 5 weeks, or about 2 human years, with the equivalent of 10 times the arsenic level considered safe for humans by federal standards. Similar levels are seen in about 8 to 10 percent of wells, said co-investigator Aaron Barchowsky, PhD, professor of environmental and occupational health at Pitt Public Health. Then the researchers injured muscle in the exposed mice and compared the outcome to those of mice that weren’t exposed to arsenic. They found a significant decrease in the ability of the muscle in arsenic-exposed mice to regenerate after the injury, and a consequent impairment of muscle function. They examined muscle tissue after taking away all the cells, leaving only what’s called the extracellular matrix, and found it had abnormally remodeled producing structural deficits. The researchers seeded the arsenic-exposed extracellular matrix with human muscle stem cells to see if healthy muscle would reform. They learned that arsenic caused heightened biochemical signals from a protein complex called NF kappa B, which is involved in matrix remodeling and tissue repair. Dr. Ambrosio, a physical therapist, noted that some patients have a harder time recovering from surgery or injury. Other co-authors include Changqing Zhang, PhD, Ricardo Ferrari MS, PT, Kevin Beezhold, PhD, Kristen Stearns-Reider, PhD, MSPT, Antonio D’Amore, PhD, and Martin Haschak, all of the University of Pittsburgh; and Paul D. Robbins, PhD, of The Scripps Research Institute. In the 3 years following bariatric surgery, the majority of patients experience an improvement in pain and walking ability, according to the preliminary results of a University of Pittsburgh Graduate School of Public Health-led analysis presented recently in Los Angeles at ObesityWeek, the annual international conference of the American Society for Metabolic & Bariatric Surgery and The Obesity Society. McGowan Institute for Regenerative Medicine affiliated faculty member Steven Belle, PhD, MScHyg., professor in the Department of Epidemiology, Graduate School of Public Health at the University of Pittsburgh and a co-director in the Epidemiology Data Center in the Graduate School of Public Health, is a co-author of the study. The study, funded by the National Institutes of Health (NIH), went on to identify key patient characteristics that can indicate which people are the most and the least likely to see improvement, a finding that could allow clinicians to identify patients who may require additional interventions to improve outcomes. Dr. King and her colleagues followed 2,221 patients participating in the Longitudinal Assessment of Bariatric Surgery-2, a prospective study of patients undergoing weight-loss surgery at one of 10 different hospitals across the U.S. Through 3 years of follow-up, 50 to 70 percent of adults with severe obesity who underwent bariatric surgery reported clinically important improvements in bodily pain, physical function, and usual walking speed. About three-quarters of the participants with severe knee and hip pain or disability before surgery experienced improvements in symptoms indicative of osteoarthritis. In addition, over half of participants who had a mobility deficit prior to surgery did not post-surgery. 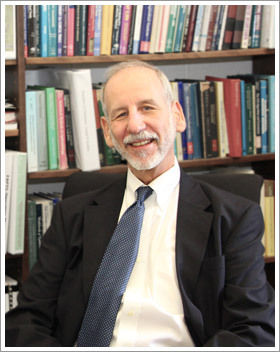 Older age, lower income, more depressive symptoms, and pre-existing medical conditions, including cardiovascular disease and diabetes before surgery, were among the factors independently associated with a lower likelihood of improvement in pain and mobility post-surgery, while greater weight loss, greater reduction in depressive symptoms, and remission or improvement in several medical conditions were associated with greater likelihood of improvement. “Functional status is an extremely important aspect of health that has not been as well-studied as other conditions that change following bariatric surgery and this study sheds light on specific factors that may affect improvements in individuals with joint pain who undergo these procedures,” said study co-author Anita Courcoulas, MD, MPH., chief of minimally invasive bariatric and general surgery in Pitt’s School of Medicine. Additional investigators on this research are Jia-Yuh Chen, PhD, and William F. Gourash, CRNP, MSN, both of Pitt; Gregory F. Dakin, MD, of Weill Cornell Medical College; Katherine A. Elder, PhD, of Pacific University; David R. Flum, MD, MPH, and Marcelo W. Hinojosa, MD, both of the University of Washington; James E. Mitchell, MD, of the Neuropsychiatric Research Institute; Bruce M. Wolfe, MD., of the Oregon Health & Science University; and Susan Z. Yanovski, MD, of the NIH National Institute of Diabetes and Digestive and Kidney Disease (NIDDK). Cohera Medical, Inc., a company spun out of the University of Pittsburgh in 2006, was named by the Pittsburgh Technology Council as the 2015 Innovator of the Year—Life Sciences during its annual Tech 50 Awards ceremony, which was held October 29 at the Wyndham Grand Pittsburgh. McGowan Institute for Regenerative Medicine affiliated faculty member Eric Beckman, PhD, and oral and maxillofacial surgeon Michael Buckley (formerly of Pitt’s School of Dental Medicine) developed the core technology that led to the company’s first adhesive technology product offering—TissuGlu. TissuGlu is a biodegradable, biocompatible product that provides surgeons with an alternative to stapling, stitching, or less-effective surgical wound sealants currently used to close large tissue flaps resulting from abdominoplasties (tummy tucks) and other surgical procedures. TissuGlu completed European clinical trials in 2010 and received a CE mark certifying its conformity with European Union health standards in July 2011; Cohera Medical launched its first products in September of that year in Germany. Surgeons use TissuGlu by using a hand-held applicator to apply drops of TissuGlu liquid. After applying the drops, the surgeon positions the abdominoplasty flap in place. Water in the patient’s tissue starts chemical reactions that bond the flaps together and cure the adhesive into a flexible solid. The surgeon then proceeds with standard closure of the skin using sutures. Compared to other options, TissuGlu seals large-lap wounds more effectively, reducing fluid buildup and potentially the need for drains, and offering a number of other advantages, including a lower risk of postoperative complications arising from drain use. 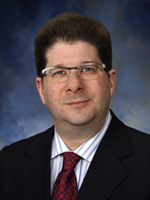 #153 –– Dr. Richard Schaub, Jr., PhD is the Senior Director of the Artificial Heart Program at UPMC and the Senior Director of Mechanical Circulatory Support at Procirca. Also, he is an Adjunct Assistant Professor of Bioengineering at the University of Pittsburgh. Dr. Schaub discusses his work with the UPMC Artificial Heart/VAD Program and with Procirca. 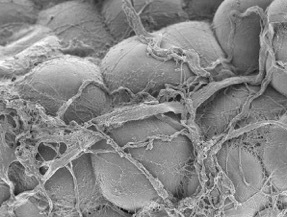 Scanning electron micrograph of human white adipose tissue. Summary: We demonstrate the additive manufacturing of complex three-dimensional (3D) biological structures using soft protein and polysaccharide hydrogels that are challenging or impossible to create using traditional fabrication approaches. These structures are built by embedding the printed hydrogel within a secondary hydrogel that serves as a temporary, thermoreversible, and biocompatible support. This process, termed freeform reversible embedding of suspended hydrogels, enables 3D printing of hydrated materials with an elastic modulus <500 kPa including alginate, collagen, and fibrin. Computer-aided design models of 3D optical, computed tomography, and magnetic resonance imaging data were 3D printed at a resolution of ~200 μm and at low cost by leveraging open-source hardware and software tools. Proof-of-concept structures based on femurs, branched coronary arteries, trabeculated embryonic hearts, and human brains were mechanically robust and recreated complex 3D internal and external anatomical architectures. Description: This project addresses the clinically significant problem of ascending thoracic aortic aneurysm (TAA). Patients with TAA have a high risk of aortic catastrophe such as a free rupture or aortic dissection. Free rupture often results in sudden death and aortic dissection poses mortality rates worldwide of over 90% in the absence of surgical intervention. Despite progress in understanding mechanisms of biomechanical weakening within the aortic media in TAA, an existing barrier to improving patient care is an incomplete knowledge of the involvement of the adventitia in aortic wall homeostasis. The PI’s laboratory identified vasa vasorum remodeling in the adventitia of human TAA specimens associated with down-regulation on of upstream modulators of endothelial function including angiogenic and hypoxic gene targets and evidence of hypoxia in the medial layer. This project will test the hypothesis that TAA is mediated by hypoxia-driven deficiency in vascular endothelial growth factor signaling causing limited neovascularization of vasa vasorum by adventitial cells. In support of this hypothesis, preliminary studies from the PI’s group revealed that pluripotential vasa vasorum-associated pericytes in human aorta were capable of forming and stabilizing endothelial networks and co- localized with endothelial cells in a perivascular location, thus uncovering a repository of resident progenitor cells that could be harnessed for their angiogenic potential. To elucidate mechanisms of vasa vasorum dysfunction in the adventitia, the first phase of the project will: 1) Evaluate the impact of hypoxia on vasa vasorum endothelial function in aneurysmal specimens from human adult thoracic aorta. To engineer neovascularization of pericytes, the second phase of the project will: 2) Direct vasa vasorum pericytes toward functional smooth muscle and endothelial cell lineages. To demonstrate the translational feasibility of an established inkjet- based growth factor biopatterning strategy to regenerate native vasa vasorum in TAA, the third phase of the project will: 3) Engineer neovascularization by vasa vasorum-associated pericytes within an in vivo angiogenic model and an in situ arterial explant model. The overall impact of this work will be the increased knowledge of mechanisms of endothelial dysfunction in the adventitia of TAA which could help transform the surgical approach to treatment using an inkjet- based deposition system to restore a healthy vasa vasorum network. The clinical translation potential of this work is an engineered off-the-shelf and minimally-invasive therapy for TAA as an “aortic wrap” for patients with genetically-triggered aortopathies or sporadic cases of ascending aortic dilatation.